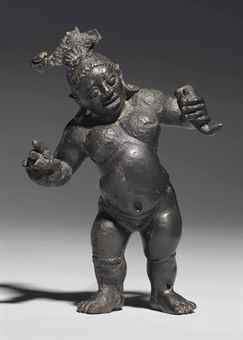 Likewise, this “rare and important” bronze figure (possibly the personification of Vishnu’s wheel, Chakrapurusha, possibly one of Shiva’s attendants) was made in India in the (late Kushan or early Gupta) third or fourth century and “acquired in Thailand in 1998“. If we knew its source, we could understand its design and appreciate the artist’s intentions. Unfortunately, Christie’s appears not to know.